Need to stretch your apps budget? 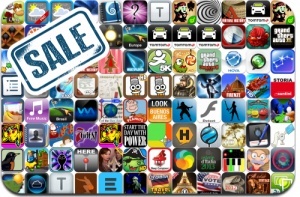 Here are 93 iPhone, iPad and iPod touch apps that just went on sale. This app deal alert includes Rayman Jungle Run, Chuggington Traintastic Adventures, Hungry Shark Evolution, Bag It!, Joining Hands, Sonic CD, The 7th Guest: Infection, Cthulhu Saves the World, Save The Pencil, Companions, Michael Jackson The Experience, and many others.